On March 28, 2008, Société des Bains de Mer et du Cercle des Etrangers à Monaco (“SBM”), a société anonyme Monegasque organized under the laws of the Principality of Monaco, filed a trademark infringement lawsuit against MGM Mirage, Inc. (“MGM Mirage”) and Victoria Partners, L.P. (“Victoria Partners”) in the U.S. District Court for the Southern District of New York. See Societe Anonyme Des Bains De Mer ET Du Cercle Des Etrangers A Monaco Cercle Des Etrangers A Monaco v. MGM Mirage, Inc. et al, Case No. 08-cv-03157 (S.D.N.Y. March 28, 2008). A copy of the complaint can be downloaded here. SBM is a holding company headquartered in Monte Carlo, Monaco, which operates several casinos and hotels, most notably Le Casino de Monte-Carlo. 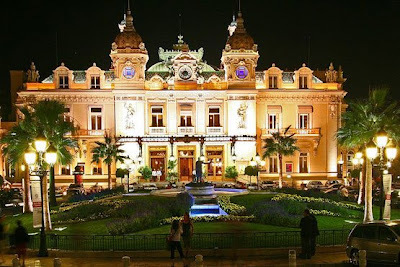 The "Real" Monte Carlo Casino? Victoria Partners, which owns and operates the european-themed Las Vegas hotel and casino Monte Carlo Resort and Casino, since it opened May 1, 1995, was originally a joint venture between Mirage Resorts International and Gold Strike LV. Circus Circus Enterprises, Inc. bought out Gold Strike, and then in 1999 changed its name to Mandalay Resort Group. Mirage Resorts International later merged with MGM Grand Inc. to form MGM Mirage. Finally, last year, Mandalay Resort Group successfully merged into MGM Mirage. The origins of this dispute appear to stem from a service mark application (technically, a concurrent use application in light of some Montana business apparently using the same name, but that's a discussion for another post) for the mark MONTE CARLO (for casino services) filed July 12, 2001, by Victoria Partners. After the mark was published for opposition on October 19, 2004, SBM filed a notice of opposition on February 15, 2005 with the Trademark Trial and Appeal Board ("TTAB"). See Societe Anonyme Des Bains De Mer ET Du Cercle Des Etrangers A Monaco Cercle Des Etrangers A Monaco v. Victoria Partners, Opposition No. 91164390 (TTAB February 15, 2005). The grounds for opposing registration (in SBM’s amended notice of opposition) were under 2(d) likelihood of confusion and 2(a) false suggestion of a connection with SBM and the Casino de Monte-Carlo. Much of the district court complaint is spent providing some interesting insight into the history of Monaco and the Monte Carlo quarter and SBM’s Casino de Monte-Carlo as well as providing details regarding SBM’s U.S. and worldwide promotion and marketing of its historic casino and the publicity the casino has received (especially in Hollywood movies) and regarding SBM’s sales activities in the United States (recruiting high rollers to visit its casino, opening credit lines for customers planning to gamble at its casino, providing a VIP card for guests staying at one of SBM’s hotels allowing free admission into its casino, and taking reservations for its hotels). As one can guess, SBM objects to Victoria Partner’s use of the name Monte Carlo in connection with casinos. The causes of action are federal unfair competition (under 15 U.S.C. 1125(a)), federal trademark infringement (the complaint cites 15 U.S.C. §1114(1) although no U.S. registered trademark is cited in the complaint), federal trademark dilution (§1125(c)), cybersquatting (under 15 U.S.C. §1125(d)), deceptive trade practices under New York law (§349(h) of the New York General Business Law), false advertising under New York law (§350-e(3) of the New York General Business Law), trademark dilution under New York law (§360-l of the New York General Business Law), common law trademark infringement, and common law unfair competition. The big question of course is what prompted SBM to suspend its TTAB proceedings in favor of a federal court action after all this time? The answer may have something to do with how SBM’s opposition was progressing. In its notice of opposition and amended notice of opposition, SBM cites to a use-in-commerce application it filed on May 2, 2002, for the mark CASINO DE MONTE CARLO for “operating resort and gambling facilities, casino gambling; education, providing of training; entertainment; sporting and cultural activities,” based on its foreign registration of the mark in Monaco, and claiming use in commerce back to 1984 (with first use in 1863) although the “operating resort and gambling facilities, casino gambling” description was apparently pared down to just “resort hotels.” Also noteworthy is the fact that on November 7, 2001, SBM had filed an intent-to-use application for the mark CASINO DE MONTE CARLO for “education; providing of training; entertainment; sporting and cultural activities” but expressly abandoned the application July 3, 2002. During discovery, Victoria Partners asked SBM about evidence of its use of the mark on all of the goods cited in its “use-in-commerce” application. After all, SBM claimed to be using the mark in commerce on certain services that six months earlier it had claimed it was only intending to use. After receiving an unsatisfactory answer, Victoria Partners filed a motion to compel a more complete response to its interrogatory about use. Soon after, on November 14, 2007, SBM filed another use-in-commerce application for the mark CASINO DE MONTE CARLO for casino services. The application again cites first use in commerce as 1984, but does not reference a foreign registration this time. Then, on December 20, 2007, SBM filed an express abandonment of the 2002 application which it had cited in its notice of opposition. So, in January 3, 2008, SBM sought to amend its Amended Notice of Opposition once again to replace the citing of the 2002 application with the newly filed 2007 application. Well, it did not take Victoria Partners long, in opposing SBM’s motion to amend, to cite the “fraud” trump card. SBM likely realized that it may have harmed its position at the TTAB (i.e., fraud and/or unclean hands) and opted to start fresh at the district court. Another reason SBM may have opted for district court could be the opposition proceeding that it is facing currently regarding a Madrid Protocol application it filed on June 15, 2005, to register the mark MONTE-CARLO BAY HOTEL & RESORT for nine classes of goods and services, including “Entertainment services, namely conducting casino games; conducting and providing facilities for special events featuring casino and gaming contests and tournaments, leasing of casino games, providing casino facilities.” On December 19, 2007, Victoria Partners filed a notice of opposition opposing SBM’s application. See Victoria Partners v. Societe Anonyme Des Bains De Mer ET Du Cercle Des Etrangers A Monaco Cercle Des Etrangers A Monaco, Opposition No. 91181442 (TTAB File December 19, 2007). SBM’s right to stop Victoria Partners from registering its mark can be addressed at the same time as SBM’s right to use the name in the U.S. The complaint notes the worldwide publicity that the Monte Carlo Resort and Casino received when the façade of the hotel caught on fire back in January of this year (see Las Vegas Review Journal article on the fire) and even includes a screenshot from CNN coverage of the fire, showing the “Monte Carlo” sign “literally tarnished and consumed by black smoke and fire” – suggesting that SBM felt the recent negative publicity the hotel received harmed its reputation and goodwill and wanted to stop Victoria Partners altogether from using the Monte Carlo name (and not just prevent a trademark registration which is the extent of the TTAB’s powers). Of course, the complaint does not address why SBM felt no concern about likelihood of confusion for the many years beforehand. In addition, the complaint notes a verbal message supposedly left by a representative of Victoria Partners with a representative of SBM on December 20, 2007, threatening to file a cancellation proceeding against an unidentified registration held by SBM. Strangely enough, the one registration that SBM did have for the mark CASINO DE MONTE-CARLO (a §44(e) application based on a Monaco registration), for various goods across three different classes including video games, printed matter, and board games, was voluntarily surrendered by SBM on February 13, 2008. Coincidence? Finally, the complaint also cites to a recent letter (attached as an exhibit, but heavily redacted) that supposedly intimates that Victoria Partners was considering bringing its own trademark infringement lawsuit, which suggests that SBM may have felt it wiser to be proactive and on the offensive with respect to its position on the mark MONTE CARLO lest Victoria Partners get to court first. Of course, the big question is why SBM waited so long to assert its rights in the first place. 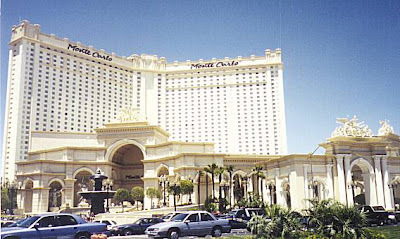 The Monte Carlo Resort and Casino has been operating since 1995. Victoria Partners did not even seek federal registration of the mark for casino services until six years later. (Note: Victoria Partners did file an application on June 9, 1997 to register the mark MONTE CARLO for “providing bar services, featuring, alcoholic malt beverages brewed on the premises” but the application went abandoned for failure to response to a non-final action). Certainly, the hotel’s name had come to the attention of SBM before that time. I have three words for SBM: Vail, Bukhara, and Laches. (Hat Tip to Marty Schwimmer at The Trademark Blog for pointing out (here) the lack of a copy of the complaint on PACER and forcing me to actually do some digging for once to unearth the current status of this long-running, contentious dispute).